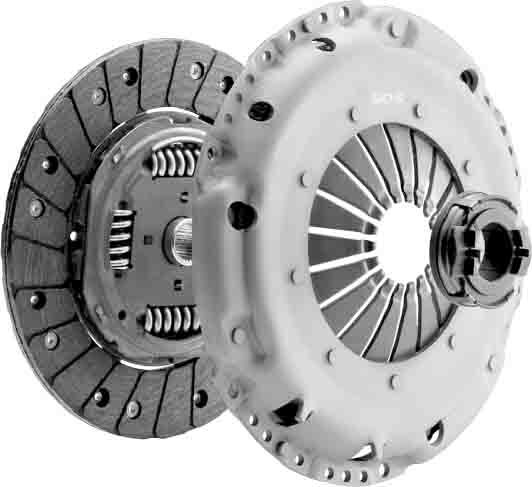 What is a clutch and how do I use it? When learning to drive the gas and brake pedal do as you would expect, i.e. gas make you go faster, brake makes you go slower. But then there is this 3rd pedal, the clutch, firstly lets look at what it does. If I was to describe what the clutch does I would say it simply connects (clutch up) or disconnects (clutch down) the engine. This video gives a simple explanation (watch from 1:40). When the engine starts to connect you will feel the car vibrate slightly and the engine noise will change, this is your biting point. A way to think about the clutch is to compare it to a tap, when the tap is turned off no water will come out, as you turn the tap the water will start to come out the more you turn the tap the more water will come out, if you turn the tap very fast the water will come out very fast and you may get wet! 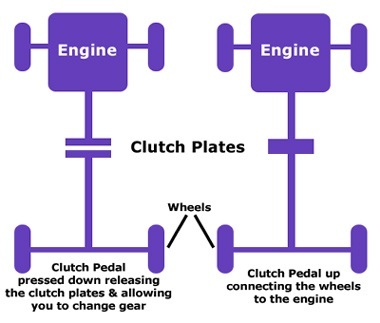 The clutch is similar with the clutch below the biting point the engine is not connected so the car will not move, as you bring the clutch up to the biting point the engine begins to connect so the car moves, the more you bring the clutch up the more the engine is connected so the car moves faster until the car is moving freely with the clutch fully up and engine fully connected. If the clutch come up too fast the engine will connect too quickly and the car may stall (i.e. the engine will turn off). This video shows some examples of how to use the clutch when driving. This video shows how you can use the clutch to do hill starts.